Harwell Campus, Harwell:British Astronaut Tim Peake and Sam Gyimah Minister for Universities, Science, Research and Innovation met with Space organisations from the Harwell Space Cluster to announce a new contract between UK industry and Space agencies and underscore their support for collaboration within the Space sector. A £3.9million contract between Airbus and the European Space Agency (ESA) will see a new rover developed to visit Mars and collect samples that, for the first time ever, will be brought back safely to Earth to be analysed. The visit united Tim Peake and Sam Gyimah with Harwell Space Cluster companies, Rezatec, Oxford Space Systems, Deimos, Lockheed Martin and Neptec as well as the European Space Agency (ESA), UK Space Agency and the Science and Technology Facilities Council’s RAL Space facility, all based at Harwell Campus. As members of a rapidly growing 80-strong group of private, public and academic organisations that form the Harwell Space Cluster, they are all focused on supporting the UK Space Sector as it aims for a 10% share of the global market by 2030. 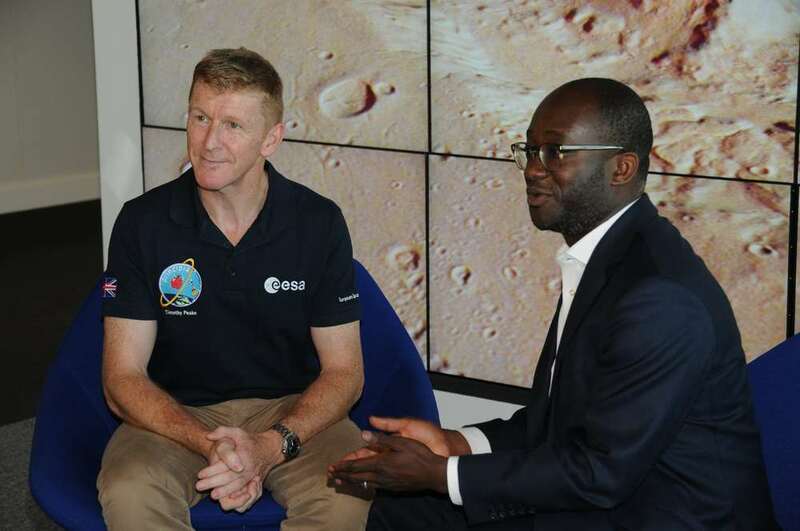 Tim Peake said: “This is an exciting new era where businesses and space agencies are working closer than ever before on ambitious missions to expand our knowledge of the Solar System and deliver benefits to people’s lives. Sam Gyimah said: “The innovation we see in the UK space industry is enabled through collaboration and partnerships between industry, agencies and academia, and Harwell Space Cluster clearly demonstrates the great work going on in this sector. The UK space sector is growing, it is worth £13.7 billion to the economy and employs more than 38,000 people across the country. The Harwell Space Cluster is growing at 13% a year, contributing to national growth and reflects the broad array of space expertise that makes the UK a world-leader in this market – small satellite technology, telecommunications, robotics and earth observation. As technology evolves and reduces the cost of access to space, there is an exciting opportunity for the UK to thrive in the commercial space age. Dr Barbara Ghinelli, Director, Harwell Campus and Cluster Development at UKRI-STFC, said: “Space companies at Harwell thrive in an entrepreneurial ecosystem that promotes growth and the commercialisation of new ideas. This is also true of companies in our Life Sciences and Energy clusters. The Government’s decision to locate the £99 million National Satellite Testing Facility at Harwell combined with the Harwell Space Cluster’s active involvement in the launch of the ‘Prosperity from Space’ initiative and the Space Sector Deal, all place the Harwell community at the heart of the UK Space sector of today and tomorrow.